I will teach novices and experts alike how to fit Bitcoin into an investment portfolio safely and with the optimum risk-adjusted potential - along with step-by-step guides, instructions and tutorials. This first part of the series starts with the basics, obtaining and managing your bitcoin. First off, we need to know what Bitcoin is since most media pundits and even experienced financial types truly do not know. Bitcoin (capital "B") is a protocol driven network (very similar to that other popular protocol-based network, the Internet). This network is a blank tapestry upon which smart and creative actors can paint a cornucopia of applications (just like applications on the Internet). An early example from the Internet is email. It's now ubiquitous, but back in the early 90s very few people knew about it or used it. Fast forward today, and not only does everybody use and know about it, it is accompanied by a cornucopia of considerably richer applications, ie. Facebook, YouTube, Netflix, etc. The Bitcoin network's first and most popular application to date is bitcoin (with a lower case "b"). Bitcoin (that's "b"itcoin - with a lower case "b") is a digitial currency applications that uses the Bitcoin blockchain and network as its transportation rails. It is a digital asset that can be a derivative of a physical asset or embedded in a physical device. Of course, that begs the question, aren't nearly all stocks, bonds and currencies digital assets. Short answer is yes. So, we are focusing on the next generation of digital assets, those that exist on the blockchain - the Bitcoin blockchain in particular. Before you get you bitcoin you need to keep in mind that as a digital asset, it is susceptible to all of the maladies that befall other things digital, with the primary malady being hacking. The primary cause of hacks are lax password practice and malware. These are generally not difficult to proof against - at least in regards to lower level hackers. Makes sure you have a clean machine: Use AVG, Norton Anti-virus, Kapersky, etc. to purge malware and viruses off of your computer/phone/tablet. Don't put your money and assets on a machine that has bad actors waiting in the background to take it. Use a password manager: The second biggest whole in most people's computing habits is weak passwords. It's actually easy to determine if your password is too weak. If you can remember your password, then chances are someone else can as well. Any password that can be memorized probably isn't complex enough. Password managers store passwords for you, encrypt them and use them on their respective properties for you. This way, you can hundreds of personalized, complex passwords, a unique one for each site or app - yet only have to remember one password. In a nutshell, autonomy is the ability to maintain control over your stuff, vs heteronomy, where you are forced to depend on a 3rd party to manage your assets. 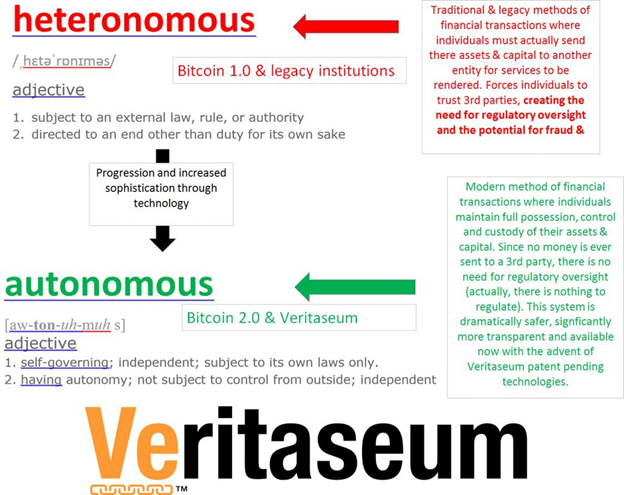 Bitcoin is fully autonomous. That's it's unique strength. Why should you give that up? You shouldn't! That means no hosted wallets, at all. A hosted walled is a wallet that its on someone else's servers to handle you assets. One of the most popular hosted wallets is the typical bank checking account. That wallet entails taking your assets (ie. digital dollars) and sending it to a 3rd party, thus relinquishing your possession, ownership and control of said assets. This has been done historically because most have not had a choice - other than stuffing dollars under the bed. and control of your assets - you should always be the one to decide what happens to your assets, and when. This means no one can confiscate, freeze, tamper with and in no way frustrate your access to your assets. Bitcoin is a bearer asset, just like the dollar bill. Think, would you rather keep your dollars in your pocket or in someone else's pocket. That's the difference between these two groups of wallet examples. Remember, any heteronomous wallet can be seized, hacked or compromised despite your efforts to keep your assets safe - simply because you have relinquished possession and control. The larger the grouping of assets, the larger the prize becomes in targeting said wallet. Acquisition, Part 3 - How Do I Get Bitcoin? Compare the prices to a mid level exchange such as Coinbase's GDAX. This also brings us back to the autonomy vs heteronomy discussion. Use exchanges as gateways only. Use them to convert fiat (government and faith backed money) into digital asses and vice versa or to trade assets when you can't find your own counterparties. DO NOT use them as storage facilities. They can and do get hacked. You are not compensated in any way by relinquishing your possession, ownership or control of your assets to these entities, yet you do assume materially additional risk. Prudent investors ensure they are overcompensated for risks. Foolish investors are always under compensated or uncompensated for risks. Be a prudent investor! The next installment of this series will go much more in depth in the investment in and trading of bitcoin, risks vs. rewards and how to integrate bitcoin into ANY portfolio. This will appeal to retail investors, professional traders and institutions alike. We will delve deeply into bitcoin investment and trading, particularly integrating bitcoin into conventional investment portfolios in ways most of you have never dreamt of, using our proprietary and patent-pending Veritaseum technology., which is currently only available for beta to BoomBustBlog subscribers. If you are interest in our proprietary research, analysis or technology - please subscribe to one of our various subscription plans here. We can set subscribers up with a recommended wallet and even send you a couple dollars worth of bitcoin to get started. This is What I Say When Asked "Should I Buy Bitcoin?" Applied Pathogenic Finance: Wall Street's "Internet Moment"